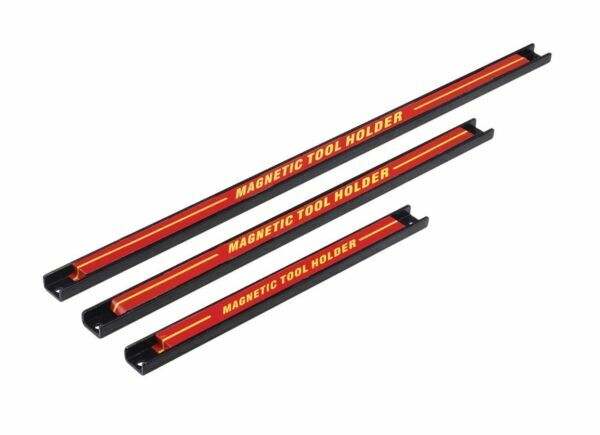 This listing is for magnetic tool bar holders in various lengths and quantities.  Free Shipping: All of our Buy It Now listings offer free shipping option to addresses in the continental U.S.
 Speedy & Informative: Most of our orders ship within 1 business day of the order being placed and a tracking number is uploaded to your order when it is processed.  Carriers: We ship via FedEx and the U.S. Postal Service. Carriers & Delivery Standard Takes 2 to 10 days FedEx Ground No weekend or holiday deliveries. To continental U.S. only. No P.O. Box or APO/FPO address delivery. Expedited Takes 2 to 6 days, depending on where the weekend falls Priority Mail No delivery Sunday or holidays. Please note: Not all items are eligible for all classes of service. Federal regulations prohibit some items from shipping via air. FedEx Delivery Restrictions: FedEx does NOT deliver to P.O. Boxes, APO/FPO and similar addresses.  30-Day Return Policy for most items - Just be sure the item is in new, re-saleable condition and in its original packaging. For example, if your tool shipped to you in a nice box with the product on the box, you must return that box with your tool inside the original corrugated box we shipped it in.  No RMA number needed - Don't like it or doesn't fit your application? Contact us through eBay and let us know you would like to return the item, we may give you special instructions or information to put on your package.  Fast processing - We process most returns and exchanges within two business days of receipt so you can quickly get your replacement item or money back.  Free exchanges - We understand that buying online can result in sizing or fit issues, if your item does not fit, you can exchange it for another size, or style, the only cost to you is the shipping and price difference if any.  Restocking fee - We do not charge a restocking fee for returned items, but return shipping is the responsibility of the buyer. If your item shipped with free shipping, we will subtract the cost of the initial shipping from your refund.  Did we make a mistake? If you need to make a return because we sent you an item, color or size that you did not order, contact us using the Ask a Question link in any listing and ask one of our great customer service people to look into it. This item carries a 1 year warranty on factory defects, but does not cover abuse or misuse of the product. Please see warranty page for more details. CLICK HERE TO SIGN UP FOR OUR NEWSLETTER WHICH INCLUDES NEW ITEMS AND SPECIAL OFFERS.